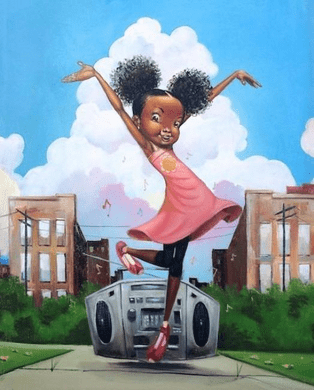 Frank Morrison Hand Signed and Numbered Limited Edition Giclee on Paper:"I Got the Rhythm"
Edition: Artist Signed and Numbered, Limited Edition to 20/5/3. COA included. About the Art: Morrison's work is inspired, not only by his rich and varied life experiences but, by his love and gratitude for his family--his wife, three sons and two daughters and the omnipresent Hand of God. Each of his paintings bears his signature, of course, accompanied by the notation "TTG" representing and reminding all of his "Thanks To God" for the blessings of his gifts--his family and his talents.